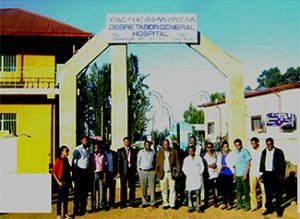 UHA will mobilize resources and funds to improve the physical infrastructure of Debre Tabor Hospital. UHA will collaborate with hospital officials, physicians, and architectural professionals to guide construction of an isolated ward for the treatment of patients with active TB. The special ward will have well ventilated rooms with negative pressure systems that minimize the chance of spreading the infection to other patients and staff where TB patients take medications until the disease is no longer infectious, This ward allows for specialized treatment and care. A separate TB ward will both improve treatment as well as prevent further transmission of mycobacterium tuberculosis. UHA will also work to ensure that the necessary personal protective equipment, including masks and gloves are available to protect clients and health workers.